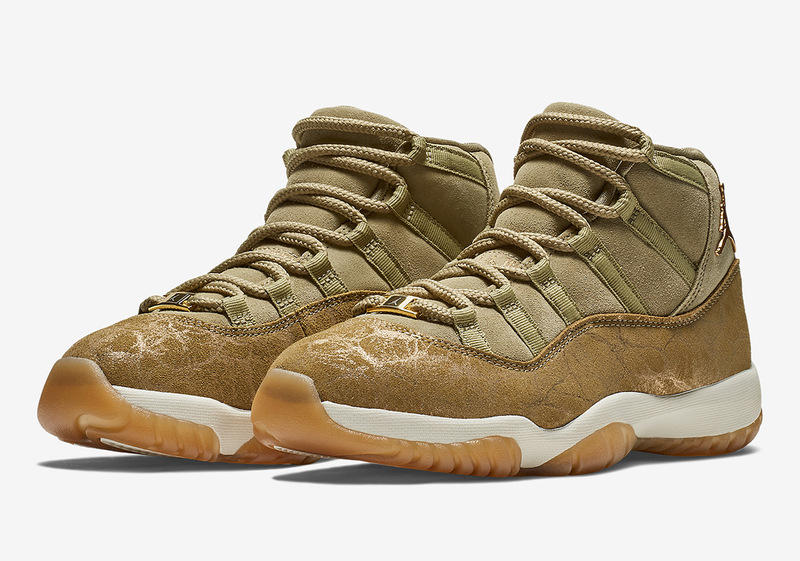 With Black Friday less than a week away, one of the most anticipated ladies-only selections has got to be the luxuriously-crafted Air Jordan 11 “Neutral Olive”. Continuing a streak of AJ11s for the females – that is now in its third straight year – this take on one of the most revered silhouettes in Jumpman history opts for a luxe combination of buttery suede, soft velvet, and metallic gold dressing up the sneaker’s customary Jumpman and lace dubraes. With the fall season in mind, its color combination ushers in an earthy array of Neutral Olive, Metallic Stout, and Sail, finished off by an oft-adored hit of gum on its sole unit. As previously stated, pairs are hitting shelves around the globe on Black Friday, November 23rd, so peep an official set of images below as well as our where to buy list that will continuously be updated until release day.